Chair hunt and Marrakesh Azure. Last week we drive out east on a hunt for chairs. I just need a couple. Not new ones. Not precious or antique either. Hard to describe but I would know it when I saw it. We only need one or two so we don’t have to use those resin porch chairs when there are more than three at the table, which happens often enough and I am grateful for it. 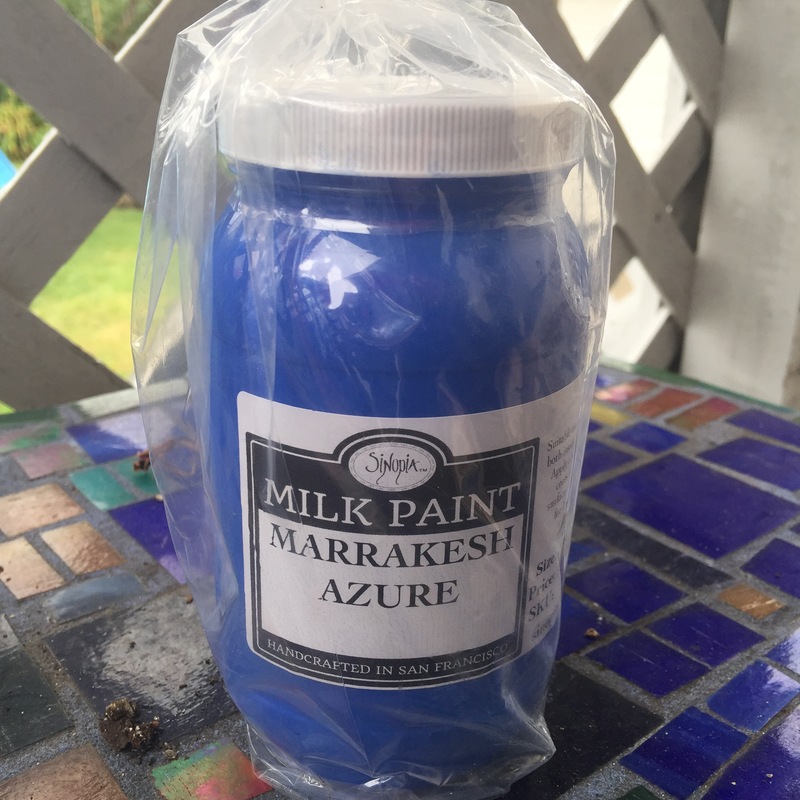 I ordered milk paint from Sinopia in this divine blue called Marrakech Azure. Just the name alone would have been enough to snare me but the color is amazing as well. My intention is to paint a couple of guest chairs. And milk paint is a lovely paint for furniture. It does not poison you and it breaks in well. I have used it before on a dining room table which now serves as my studio table. Or junk table on the porch, depending on the day. Our search for chairs was fruitless, or at least chair less. Technically we did get some fruit at a farm stand. And some corn and a bag of apple cider doughnuts if you must know. That was dinner. Alas the elusive chairs remained sequestered in whatever garage or attic or dumpster they were sentenced to and did not come out for the garage sale or the few antique type places where we stopped. It was mostly our fault. We did not start out early enough and our chair radar was clouded and obscured by the overall sense that we really do not need another thing in our house. The corellation might be made with the sensation you have right after eating a good meal served at a table full of people with whom you are happy to spend your time. Full and happy and needing no more. Only seated upon those tacky resin porch chairs. I will just be humble and grateful for the meal and the company. I am still keeping an eye out for the perfect chairs. The paint was delivered today.